Dedicated Hunters tackle tough projects that benefit deer and other species. FOR 13 YEARS, I have been enrolled in the DWR’s Dedicated Hunter program and worked on projects in the Southwest Desert area. I’ve seen this work greatly benefit everyone: the wildlife, fish, hunters and ranchers. 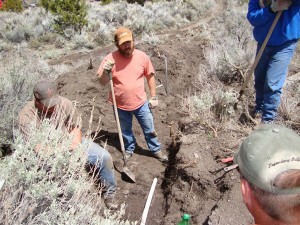 Projects can involve pipeline restoration, pinyon-juniper removal, fence building, guzzler construction, planting seedlings and other work that improves wildlife habitat. Over the years, I have helped with many types of projects. One year, I planted cottonwood trees on the Indian Peaks to stop drainage problems. This project helped the wild turkeys thrive and added cover in the area. I’ve also worked on two big-game guzzler projects that introduced water to an area where deer and elk could never thrive without assistance. Last year, I worked to restore an abandoned pipeline system. 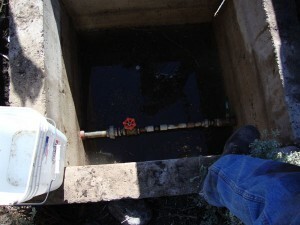 This system provided water to two separate drainages. Accompanied by local ranchers and dedicated hunters, we repaired approximately 15 miles of pipeline with the help of a backhoe. (Someone else had donated the backhoe’s services to the project.) The project took many hours and required lots of hard work. When we finished the first leg of the project, it restored water to areas that hadn’t seen moisture for years. The outcome was definitely worth all the time and effort. The most gratifying part of last year’s project was our interaction with one of the ranchers. He mentioned multiple times that our work had given him a different outlook on hunters. He was shocked to see how involved we were and how much we, as dedicated hunters, cared about the projects we worked on. Having an adequate water supply is critical to the survival and growth of wildlife populations. Many of our projects involved bringing water to arid areas. Over the years, I have been able to return and hunt the areas where I completed projects. It’s been great to see the positive difference we’ve made in these desert areas! The upcoming deer season will be exciting at my house, because I will be hunting with my twelve-year-old daughter (who is also a dedicated hunter) for the first time. My expectations for the season are very high. Because of the dedicated hunter program, there have been great improvements in many areas — not only in the Southwest Desert, but across the state. I have witnessed first-hand the good of this program, whether it deals with wildlife, hunters, families, ranchers and even our local economy. I hope to continue participating in the program — and making a difference in my favorite hunting spots — for many years to come. The DWR appreciates Aaron’s willingness to guest blog about his time in the Dedicated Hunter Program. In light of the unit-based deer-hunting changes that will go into effect in 2012, the DWR is proposing some changes to the Dedicated Hunter Program. We encourage all current and past dedicated hunters to review the changes and to attend local regional advisory council (RAC) meetings, where you can provide feedback on the proposals. What an awesome outcome for all your hard work! It’s terrific that the dedicated hunter program can help bring together different, usually opposed, perspectives, such as those of hunters and ranchers. Best of luck to you and your daughter as you hunt together this year. Thanks for sharing your experiences!